Where to purchase movement facilitating devices? We have dived into a sea of fun, active and authentic experiences, and have highlighted the ones we think will provide you with the best memories. Browse the gallery below and experience only the best Portorož has to offer. Take a boat trip to the marvellous Gulf of Piran. Visit the ancient Sečovlje saltpans, take a look at salt fields, "where sun loves the sea and changes it into salt". Discover the life of the salt workers long ago and today. Discover why people say Piran is a town, grown on salt, and finish your guided tour of romantic Piran in front of the church, where in good weather conditions you can see 3 countries. Experience the beauties of Slovenian Istria on the waves of the Adriatic sea! In THALASSO SPA LEPA VIDA, sea gifts are offered in a beautiful saltpan environment; it is good for your body, organism, balance, energy, nourishment and skin renovation. 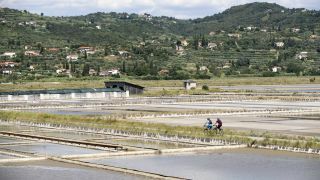 You can choose among treatments with natural products from the Sečovlje saltpans. Salt mud and salt brine - mother water, salt and seawater are the most important products of Thalasso therapy in the saltpans. In LifeClass Portorož we help you live better and longer. The several century long tradition in Portorož has always been based on a holistic approach to treatment. The combination of the Mediterranean, 5 local natural factors, protective Mediterranean diet, holistic medical wellness and the most modern medical science is a unique recipe for life-style optimization, and health and vitality until old age. Discover healthy enjoyment on the Adriatic coast. Join us on a cycling trip along the once narrow-gauge railway track Parenzana (1902-1935), one of the most popular cycling paths in Europe. The wonderful panoramic views (the salt pans, Grožnjan, Motovun, tunnels and viaducts...) will be your reward and who knows, they might even persuade you extend your weekend by the Slovenian coast. Go on an adventure full with rich tradition and the authentic feel of the Mediterranean. Use the filters below to browse through our comprehensive list of current offers and choose your experience. Not sure what to do? Begin here! I would like to be informed of events taking place in Portorož and Piran, and therefore agree that my personal information may be used for the purpose of receiving news and notifications about events as well as special offers. Learn more about your new rights under the GDPR regulation here. Where to go in July? To the Slovenian Istria! The Famous Venetian House Painted Red Again?